SEO companies, who were the darlings of the business world in the early part of the 2000 decade, were hit hard by changes in the Google search algorithm. Almost everything they were advising businesses to do in 2005, has been completely reversed. Companies that were aware of the trends were able to take advantage of the changes and rocket to the top of the charts, those that didn’t, fell quickly off the front page of search. If you were a Computer service tech or programmer during Y2K you were in high demand. Every company with any type of computer infrastructure wanted to make sure that the world didn’t end for them on January 1st, 2000. Yet, soon after that, huge advances were made in fiber optic cabling around the world. Web speed increased exponentially and soon it was as easy for a tech or programmer in India to do the computer work of one in the United States. Whole tech departments were moved, jobs were eliminated and the entire industry was rocked by little glass fibers running under the ocean. 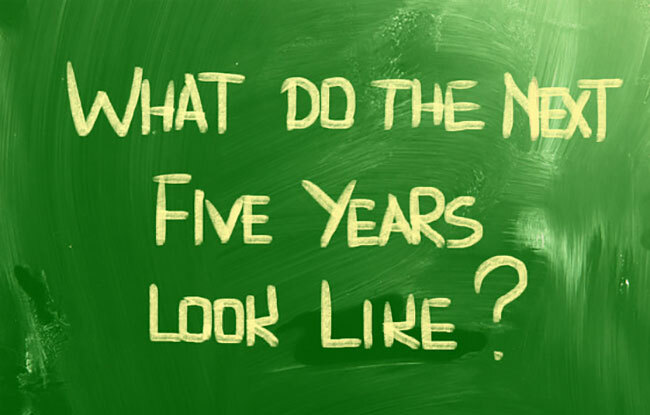 Going in to the decade,if you knew what the trend was, you could avoid being caught up in the turmoil by changing jobs or consulting for profit. In fact, if you knew the trend, you could go to work for one of the leading edge companies innovating or start your own business to profit from the changes. Think about our immediate future. We are on the brink of a robot explosion. These new machines will be brought in to replace expensive employees in many different industries. 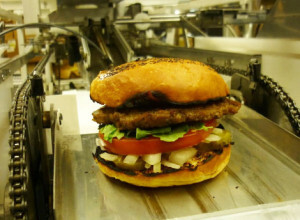 If you currently flip hamburgers for McDonalds, you’ll probably see your job disappear over the next five years as a fast food robot who can make burgers ten times faster replaces you. If you are a library clerk, bank teller or loan officer, you’re almost certain to be replaced by an automated process or robot over the next decade. However, if you are a doctor, dentist, or elementary school teacher, your job will most likely be in high demand. It’s helpful to view a list of the Most Secure and Least Secure jobs in the robot economy and see if you are presently in danger or not. I was surprised by some of the occupations on the list. Umpires and Referees were number two on the most endangered, while sales engineers and lodging managers were considered very safe. To give you an idea on future trends, author and speaker Daniel Burrus has put together a free list of certainties and written an insightful book, Flash Foresight, on the subject. He lists some ways that you can know for certain that specific things will happen. He calls these hard trends. Items that may happen, but are not certain, are listed as soft trends. Will have increasing health needs. As you can see, soft trends are based on what is happening now, but the future direction is not guaranteed, whereas the hard trends are certain to happen. As you can see we have divided up the sheeting into four broad categories across the top, with three horizontal steps that include our goal, the trends that may affect the outcome, and the resulting modified plan. They are.. Here is an example of how you might fill out the Professional Goals Column. Currently you are finishing junior college and want to get a job as a bank teller and move up the ladder over the next five years. Looking at the trends, you see that bank tellers as a profession are in danger of being replaced. To fit in with the market trend, you look at the direction the financial services industry is going and see there is a high demand for some of the new investment products coming online. Unfortunately, they require a certification to be able to market them. You decide to go back to school, get certified, and leap frog your career to a high demand area. You jump at least one rung up your career ladder by taking the trend into account. By researching and listing hard trends, both positive and negative, you can modify your goals and better prepare for the next five years. Instead of going forward in areas of great change unprepared, you’ll have the knowledge to make better decisions. I really wish I would have had this worksheet and a little foresight when I was in my twenties. It would have saved me a lot of mistakes and helped me be more diligent about what was really important. 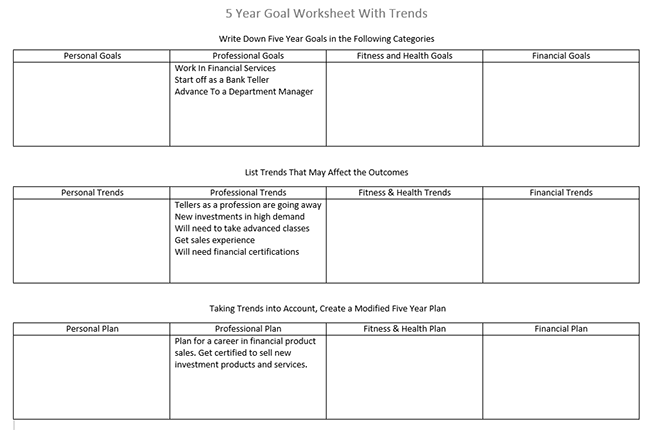 Download the worksheet below and take some time filling out the goal section at the top. Then fill in the middle section with trends that may affect their outcome over the next five years. Once you are done, create a simple written plan to achieve them. Use our examples above as a guide. In our next post, we’ll take a look at shorter term goals and a unique calendar that will help us succeed in accomplishing them.